BSN reports that GlobalFoundries (GF) has successfully produced batches of zero-defect wafers on the 28nm process. GlobalFoundries is a chip fabrication company that used to be AMD’s fabrication division. While the sample BSN observed might not be huge in proportion to the roughly 35,000 wafers GF goes through per month, it is still an achievement. GF’s success is significant, considering all the trouble Taiwan Semiconductor Manufacturing Company (TSMC) is having with their 40nm process. 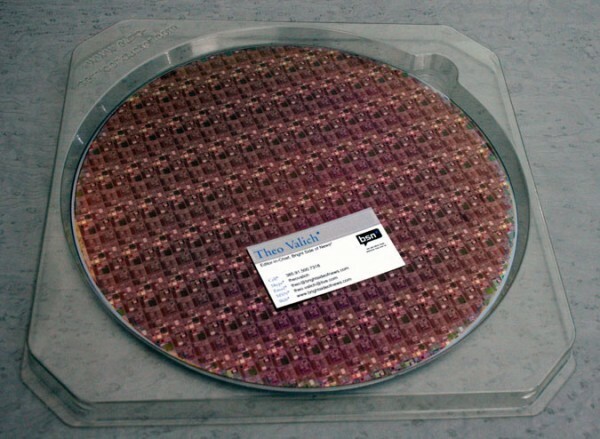 Having defect-free wafers now is a good indication that GF’s 28nm process will have strong yields. AMD is purported to be switching manufacturers of their upcoming generations GPUs from TSMC to GF. Considering all of the yield issues we’ve seen with ATI’s 5xxx series and Nvidia’s GTX 4xx lines, the move to a new 28nm process is highly anticipated. AMD is set to launch their next gen of chips, codenamed “Southern Islands,” around September of this year. Unfortunately, “Southern Islands” will remain on TSMC’s 40nm process and the generation following it, “Northern Islands,” is slated to be the first produced on GF’s 28nm process. Consumers should expect significantly faster graphics processors when Northern Islands debuts. GF’s 28nm process will allow for more advanced architectures, and if AMD follows the route it took with the 5xxx series, very efficient power usage too. Other chip makers in addition to AMD will probably jump over to GF. Qualcomm has expressed interest in the new 28nm process, which means we’ll see more powerful smartphones. It’ll be interesting to see what Nvidia and TSMC decide to do, since Nvidia has claimed that it won’t move over to AMD’s former fab. Overall, we could see a drop in prices in the semiconductor industry if competition between GF and TSMC is strong.